Like you probably know, the uTorrent developers said they will be releasing uTorrent for Linux a while back. The first step has already been made with the release of a headless uTorrent client for Linux which you can control through the WebUI (Web User Interface). There is also work ongoing for the GUI (graphical user interface). To run the uTorrent server, download it from HERE, extract it and run the "utserver" file (double click it). Then, in your browser, enter the following address: http://localhost:8080/gui/ and when asked, enter "admin" for username and blank for the password. You're probably wondering how to tweak settings like the port, the folder where you download the bittorrent files and so on. All the settings are stored in a file called "utserver.conf" which you must created in the uTorrent server folder you've just downloaded. Read the documentation which you can find in the "docs" folder - open the "uTorrent_Server.html" file in a browser. Like I said, all the available settings can be found in the documentation - read it! 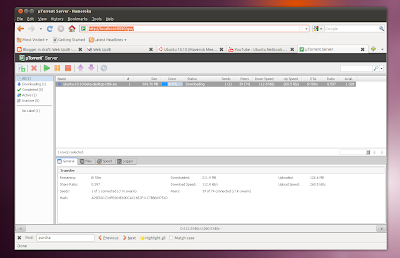 uTorrent server for Linux is currently available for 32-bit Ubuntu 9.10+, Debian 5+, Fedora 12+ (others untested). You need Linux kernel 2.6.13 or newer.